Janet Marie Smith, the nationally renowned baseball planning and development executive who partnered with Pawtucket Red Sox Chairman Larry Lucchino to create Oriole Park at Camden Yards and to save historic Fenway Park, will participate with the PawSox development team as it considers all options regarding the future site of the Boston Red Sox' Triple-A affiliate. 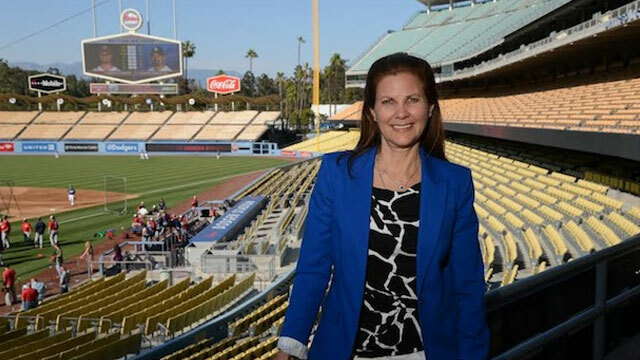 Smith, the Senior Vice President, Planning and Development for the Los Angeles Dodgers, will remain in that position, where she has overseen a $175 million renovation of Dodger Stadium and a complete overhaul of their Dominican Republic training academy, Campo Las Palmas. She will work with the PawSox simultaneously. Smith will also be spending time in New England because she was recently appointed by Yale University's School of Architecture as the Edward P. Bass Distinguished Visiting Architecture Fellow for the Fall 2017 Semester. With the PawSox project, Janet Marie will reunite with her mentor who first brought her into baseball. Lucchino hired Smith in December, 1988, to translate into an architectural reality his vision for a traditional, old-fashioned downtown ballpark with modern amenities. Oriole Park at Camden Yards, which opened in 1992, launched a revolution of new ballparks in Major League Baseball and Minor League Baseball, many of which have also revitalized their downtowns. After Lucchino took over the San Diego Padres and Smith worked with the Braves' Stan Kasten on various projects in Atlanta, the two were reunited to save Fenway Park, starting in 2002. After completing those renovations, Smith re-joined the Baltimore Orioles, where she transformed their Spring Training site in Sarasota, Florida. She then rejoined Kasten with the Dodgers.